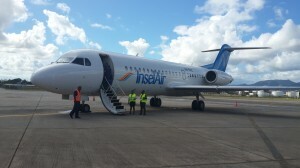 WILLEMSTAD - Employees of the local aviation company InselAir are still waiting in vain for their salary. Interim Prime Minister Gilmar Pisas refuses to transfer the next part of the bridging credit. This would pay the salaries of this month. According to Pisas, the employee registry of the airline is not correct. Transferring that data may be in violation of the privacy laws. During the election day, a group of the airline employee requested information about their salary to the leader of Korsou di Nos Tur Amparo (KdNT) dos Santos. Dos Santos said that he ordered his Ministers not to pay those salaries because he will not continue to give a single dime to the airline. The bank accounts of those employees must be given directly to the government for the payment. Dos Santos also said that he doesn’t trust the current InselAir management. He told the employees that if he transfers the money to InselAir, they will not get their salaries. Third on the KdNT list, Dr. Edward Braam, also promised that this week the employees will get their salary.